Dublin, Ireland-born chef Brian McCourt will tell you that his love for cooking absorbs him but that a good portion of what he does in his work is developing and mentoring young cooks entering his kitchens. 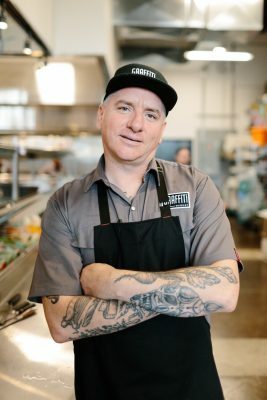 While he still cooks regularly in his role as Culinary Director with the Ignite Group, he sees himself as helping build the culinary landscape that is growing around him. 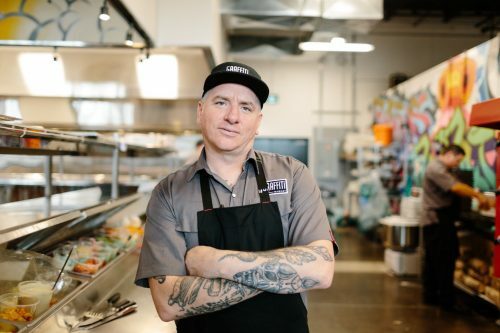 “I’ve worked with a whole bunch of cooks who have gone on to some significant roles in the industry through the years. I really enjoy that aspect of what I do,” McCourt says. He calls himself self-trained and did not attend culinary school. “I knocked off the hours and did an apprenticeship at the Charcoal Steak House was I much younger. I challenged the exam what must have been 12 years ago and got my Red Seal (certification) that way,” he says. His resume includes stints at Rebel Creek Golf Club, the former Salute in Waterloo, Four Points Kitchener and Festival Inn Stratford. “It must be more than a decade now that I started at The Bauer Kitchen. I can’t believe it.” The Ignite Group, where he currently works, includes The Rich Uncle Tavern in downtown Kitchener, the soon-to-open and re-imagined Black Forest Inn that has become Crowsfoot Ciderhouse in Conestogo, and the recently opened Graffiti Market in a sparkling new location on Glasgow just on the edge of Belmont Village. His experience past and present will get McCourt where he wants things culinary to go. “I just want to build great teams and great environment and culture. I’d say that what we have at Graffiti is modern Italian. That’s why we decided to go with Detroit-style pizzas,” he says. That pizza is deep and delicious, the pastas are freshly made in-house, and the salads and appetizers are influenced by simple, fresh ingredients. Whether it’s Italian, Irish, German or French, the dishes that McCourt prepares are based in his own personality: casual and inspired with a love that he has for cooking. While McCourt’s hobby when away from the stoves is music, he will tell you otherwise – that his passion and investment in what he does is all-encompassing. Waterloo Region Tourism: Best thing you’ve ever eaten? Brian McCourt: Foie, brioche and blood pudding at The Black Hoof, Toronto. Other career you could have pursued? Chef you’d most like to meet? Best footwear (for the kitchen or otherwise)? Favourite international food in Waterloo Region? McCourt: Cameron Seafood for dim sum. Pho Dau Bo for soup. Pupuseria Latinos for pupusas. What scares you in a kitchen? McCourt: People with poor knife skills. McCourt: First time I tried making pancetta. Something that gives you great pleasure? McCourt: Being in the kitchen. A favourite teacher you’ve had? McCourt: Mr. Macalister. He was my 4th class teacher back in Ireland. A moment in your life you’d like to have back? McCourt: Liverpool winning the UEFA soccer Champions League against AC Milan. McCourt: The Stone Roses, part of the “Madchester” scene of the 1980s. McCourt: Cured meats, pickles and cheeses. Of course with fresh bread. Best thing about being a chef? McCourt: Working with the young cooks. Dumbest purchase you’ve ever made? TV chefs who annoy you? McCourt: Rachael Ray and Ricardo Larrivée. Would you describe yourself as sweet or savoury? According to Ontario Craft Brewers there are over 80 microbreweries in Ontario and nine of them are located within the Waterloo Region. The Waterloo Region Craft Ale Trail continues a 165 year brewing tradition that started in the 1830’s with Kuntz and Sleeman Breweries.